Introduction: Afghanistan is a traditional agriculture country; Agriculture plays a major part in economy, but arable lands are less than two-thirds of the agricultural lands and mainly focus on Afghanistan's north, northeast and western regions. Zhari is located on the north bank of the Arghandab River that runs east to west through Kandahar Province. The built-up and farmed area of Zhari is approximately 30 km east to west by 8 km north to south between the Arghandab and Highway 1. Grapes, poppies and canabis are the most common crops. The farmlands are irrigated by a complex system of wadis running parallel with the Arghandab, it is low efficient and cannot meet the irrigation demands, Solar water pumping system brought new hope to local farmers. Solution: Solartech Solar water pump system was installed in this area in Dec, 2012. Water is pumped from underground with 35m head, pumping 300m3/day. 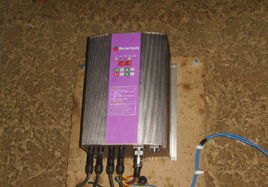 This system can meet the local irrigation demands of crops like wheat、cotton. 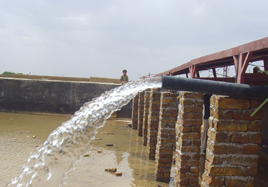 Economic Benefits: PS7500 solar pumps system annually generates 14815 kWh. In its 25-year lifespan, the solar irrigaton system can save standard coal 139.3 tons, reduction emission of CO₂61.3tons, SO₂2.8tons, smoke 2.1tons, lime ash 36.2tons.